Immunoglobulin G4 (IgG4)-related biliary and pancreatic disease can clinically and radiologically mimic cholangiocarcinoma (CCA) or present as periampullary mass resulting in uncalled for surgical resections. Thus, it is essential that efforts should be made to recognize this disease clinically, to avoid unnecessary surgical interventions and morbidity associated with it. However, malignancy has to be completely excluded to avoid inappropriate treatment. A 61-year-old male was admitted with complaints of yellow discoloration of eyes, decreased appetite, and weight loss for the past 3 months. He had a history of pain abdomen 8 months back which on evaluation was considered as acute on chronic pancreatitis. Investigations revealed features of obstructive jaundice. CA19.9 and carcinoembryonic antigen were within normal limits [Table 1]. Computed tomography (CT) upper abdomen showed diffuse circumferential thickening of the wall of the gallbladder, common hepatic and proximal part of bile duct with upstream dilatation of intrahepatic biliary radicles and narrowing of the common bile duct (CBD). Borderline splenomegaly was present [Figure 1]a and [Figure 1]b. Endoscopic retrograde cholangiopancreatography revealed long CBD stricture for which stenting was done. The patient was treated conservatively. However, after a month, there was no improvement in his symptoms. Spyglass biopsy was negative. Table 1: Results of laboratory investigations of Case I and Case II editable format for table 1 given below. As CCA could not be excluded, resection of the gallbladder, CBD, right and left hepatic ducts with Rou–en-Y heptojejunostomy and T tube placement were undertaken. The surgical specimen on gross examination showed uniform, rigid, thickening of right, left hepatic ducts, CBD, and gallbladder with narrowing of the lumen. Mucosa and serosa were smooth. On histological examination, right left hepatic duct, CBD and gallbladder showed dense plasma cell, lymphocytic infiltrate in the wall along with spindle cells showing storiform arrangement [Figure 1]c and [Figure 1]d. Obliterative venulitis was present [Figure 1]e. Lymphocyte and plasma cell infiltrate were surrounding biliary glands in the wall of ducts. Nerve bundles were hypertrophic with prominent perineural lymphoplasmacytic infiltrate. No evidence of malignancy was present. Immunohistochemistry (IHC), for IgG4, was performed using mouse monoclonal antibody (MRQ-44)-Cell Marque primary antibody, for IgG Polyclonal rabbit antihuman gamma chains antibody (Dako) was used. IgG positivity was seen in plasma cells with IgG4 positivity in 70% of the plasma cells (about 100 cells/HPF) [Figure 1]f. A diagnosis of IgG4-related disease (IgG4-RD) involving biliary tract and gallbladder was made. A 42-year-old male patient presented with chief complaint of abdominal discomfort for the past 2 months. He was recently diagnosed with diabetes mellitus for which he was taking ayurvedic medicines. On routine investigation, Gamma GT and serum tumor markers showed mild elevation [Table 1]. His axial/coronal contrast-enhanced CT abdomen showed a well-defined homogenously enhancing hypodense soft-tissue mass in the periampullary region involving the lower end CBD and pancreatic duct, inseparable from the pancreatic head, projecting into the second part of duodenum resulting in double duct dilatation [Figure 2]a. 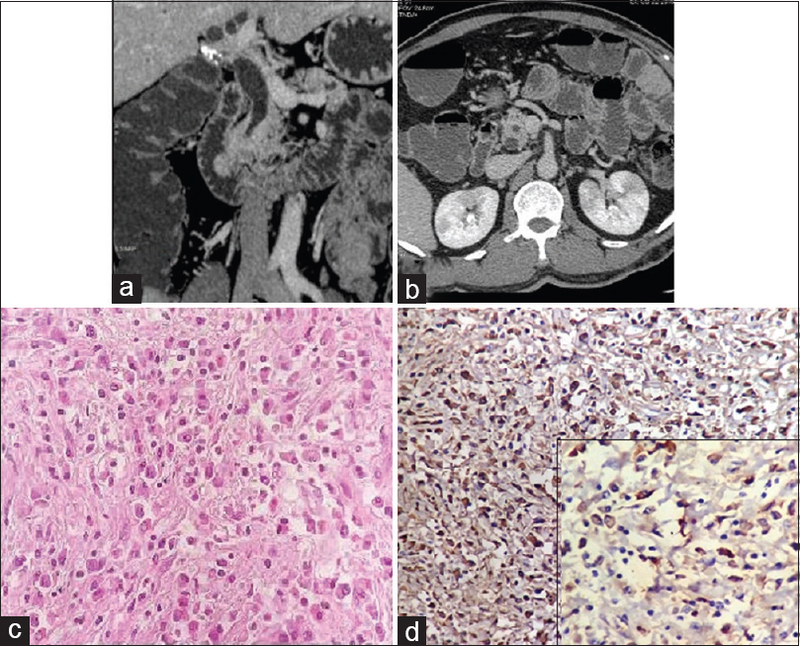 Bilateral renal parenchyma showed nonenhancing hypodense lesions considered to be due to pyelonephritis [Figure 2]b. Upper gatrointestinal endoscopy showed ampullary bulge with overlying normal mucosa. The patient was taken up for surgery with preoperative diagnosis of periampullary malignancy. Pylorus-preserving pancreaticoduodenectomy was done based on the clinical and radiological picture. Grossly, the CBD was dilated and thickened. The second part of duodenum showed a polypoid mass at the ampulla which was extending into the pancreas. The mucosa was smooth with no ulceration. Microscopic examination revealed similar morphology in pancreas and CBD as seen in the first case [Figure 2]c. The antibodies used for IHC stain were the same as in case 1. Most of the plasma cells were positive for IgG with about more than 60% of cells being positive for IgG4 [Figure 2]d. Thus, a diagnosis of IgG4-RD involving pancreas and CBD was rendered. Diagnosis of IgG 4-RD is based on a combination of clinical features, serology, i.e., raised IgG 4 levels, imaging, histological picture, multiorgan involvement, and response to steroids., Histology is considered as gold standard for diagnosis and is characterized by dense lymphocytic and plasma cell infiltrate, storiform fibrosis, obliterative phlebitis, and the presence of a large number of IgG4 positive plasma cells. The disease has a predilection for pancreas, biliary tract, salivary glands, kidney, lung, and retroperitoneum with most of the cases involving biliary tract and pancreas. IgG4-related pancreaticobiliary disease can manifests as IgG4-related sclerosing cholangitis (IgG4SC) if dominant involvement is of CBD and as autoimmune pancreatitis (AIP 1) if dominant involvement is of the pancreas. However, both represent spectrum of one disease and are usually associated. Our Case 1, presented with obstructive features and Case 2 presented as periampullary mass lesion involving CBD and head of the pancreas and were diagnosed after resection as IgG4-RD. IgG4 SC is usually seen above 50 years of age, and most of the patients are male. These patients present with abdominal pain, weight loss, and obstructive jaundice. IgG4 SC is associated with AIP in more than 90% of cases. Our case 1 had a history of pancreatitis about 6 months back, and case 2 had bilateral nonenhancing hypodense lesions in the kidney. Thus, IgG4-RD should have been suspected in these cases and serum IgG4 estimations done. Serum IgG4 is raised in these cases, although not diagnostic in isolation. IgG4 above 300 mg/dl is highly suggestive of IgG4 SC. However, levels between 135 and 300 mg/dl should be interpreted with caution as serum IgG4 levels may be elevated up to 300 mg/dl in some patients of primary sclerosing cholangitis (PSC) and CCA. Serum IgG4/IgG1 >0.24, IgG4RNA, IgG4/IgG1 RNA ratio., IgG4 positive B cell receptor clones determined by next-generation sequencing are considered to accurately distinguish IgG4 disease from biliary and pancreatic malignancy. CA19.9 was within normal limits in our cases. CA19.9 can show a mild increase in IgG4 SC up to 100 IU/ml. In CCA, it is high (median 290 IU/ml). Typical imaging features can be appreciated on CT, magnetic resonance (MR), and MR cholangiography. IgG4 SC is characterized by long stricture with concentric thickening of the wall of the duct along with delayed contrast enhancement. Multi-detector row CT also helps in distinguishing IgG4SC from extrahepatic CCA. IgG4SC shows concentric wall thickening, smooth inner margins, and homogenous attenuation in arterial phase, intrapancreatic bile duct involvement, smooth outer bile duct margin, fully visible lumen, funnel shape proximal duct and abnormal pancreatic findings. Conversely, dual-layered attenuation in all phases is significantly more common in CCA. Biliary lesions are larger in IgG4 SC than in extrahepatic CCA and PSC. Multiorgan involvement on PETCT also favors IgG4SC disease. PSC on MR cholangiography demonstrates diffuse, multifocal short segment strictures with mild dilatation of intrahepatic and extrahepatic ducts giving the beaded appearance. As fibrosis progresses, peripheral ducts are obliterated resulting in pruned tree appearance. Almost half of the patients have some degree of mural irregularity. On imaging IgG4-related pancreatitis is fairly characteristic in the form of diffuse parenchymal enlargement with delayed enhancement without low-density mass. Our case 1, on imaging, had a long stricture, diffuse concentric thickening of the wall involving CBD, right and left hepatic duct along with a narrowing of the lumen. The luminal surface as well as the outer serosal surface was smooth which is very characteristic of IgG4 SC. Our case 2 showed a mass lesion involving ampullary region (CBD and head of the pancreas) and was considered on imaging as periampullary carcinoma. However, given bilateral hypodense lesions in renal parenchyma seen on imaging indicating multiorgan involvement IgG4-RD should have been considered. On gross examination, IgG4SC generally affects large bile ducts, including extrahepatic hilar and perihilar ducts and can involve gallbladder. Our case 1 showed the involvement of right and left hepatic and CBD. Concentric rigid thickening of bile duct was seen with the narrow lumen and smooth luminal and serosal surface. These features are characteristic of IgG4-RD. Gallbladder also showed uniform smooth, rigid thickening of the wall which was an unusual appearance. Diffuse gallbladder involvement is not seen in seen in CCA. Our case 2 showed dilated CBD with concentrically thickened rigid wall which is very characteristic of IgG4-RD. A polypoidal mass with well-defined margins was seen at ampulla which was extending into the pancreas. The duodenal mucosa over the mass was smooth. The smooth normal duodenal mucosa over the well-defined mass was unusual and maybe a distinctive feature of IgG4-RD. Histologically, IgG4 cholangitis shows extensive plasma cell and lymphocytic infiltrate in the absence of granulocytes accompanied by storiform fibrosis. Occasional eosinophils and macrophages can be seen. Luminal surface is smooth. Obliterative phlebitis is present with lymphocytes, plasma cells along with fibrosis in the wall of veins. The lymphocytes and plasma cells are seen in the lumen of veins as well. Rarely, arteries are also involved. The fibroblastic population is fibroblasts or myofibroblasts. Necrotizing arteries does not support IgG4-RD. On IHC, IgG4-positive cells have to be revealed in diagnostic numbers, i.e., >100/HPF in surgical specimen and >10/HPF in small biopsy specimens as per the consensus statement published in 2012. However, this criteria needs explanation as cells are being counted in HPF in both cases. A ratio of IgG4/IgG positive cells counts of >40% also favors the diagnosis of IgG4 SC. Lymphocytic population is predominantly T cell. Plasma cells are polyclonal. This infiltrate is transmural, evenly distributed in the wall of ducts and is seen around the peripheral biliary glands. Infiltrate can extend in the perihilar ducts and portal areas of the liver. If small ducts are involved, inflammatory nodules along with spindle cells can be seen in peripheral portal tracts. Our case 1 showed characteristic histology of IgG4SC with diffuse transmural infiltrate rich in IgG4 positive cells. The luminal surface of CBD was preserved in spite of placement of the stent. Case 2 showed similar infiltrate in the CBD and pancreas. The lymphocytic population was a mixture of T and B lymphocytes, and large number of plasma cells were IgG4 positive in both cases. The inflammatory myofibroblastic tumor also needs to be excluded. Although liver fibrosis is inconspicuous in these cases; portal hypertension and cirrhosis can be observed occasionally. Four out of 53 patients of IgG4 cholangitis developed portal hypertension and cirrhosis within five years of initial symptoms in one of the studies. Diagnosis of IgG4sc involves multimodality approach. Preoperative recognition of these cases is possible if the careful critical assessment of all parameters is done. Both cases had presurgical clinical features indicative of IgG4-RD, i.e., case no. 1 had pancreatitis for 6 months. Pancreatitis is associated with IgG4 sclerosing cholangitis in more than 90% of cases. Case no. 2 had lesions in kidney indicating multiorgan involvement, which is one of the important feature of IgG4RD. Both cases should have been given a trial of steroids as response to steroids within 2 weeks establishes the diagnosis. Authors acknowledge secretarial help provided by Ms. Noora Baweja. Deshpande V. The pathology of IgG4-related disease: Critical issues and challenges. Semin Diagn Pathol 2012;29:191-6. Chari ST, Smyrk TC, Levy MJ, Topazian MD, Takahashi N, Zhang L, et al. Diagnosis of autoimmune pancreatitis: The mayo clinic experience. Clin Gastroenterol Hepatol 2006;4:1010-6. Stone JH. 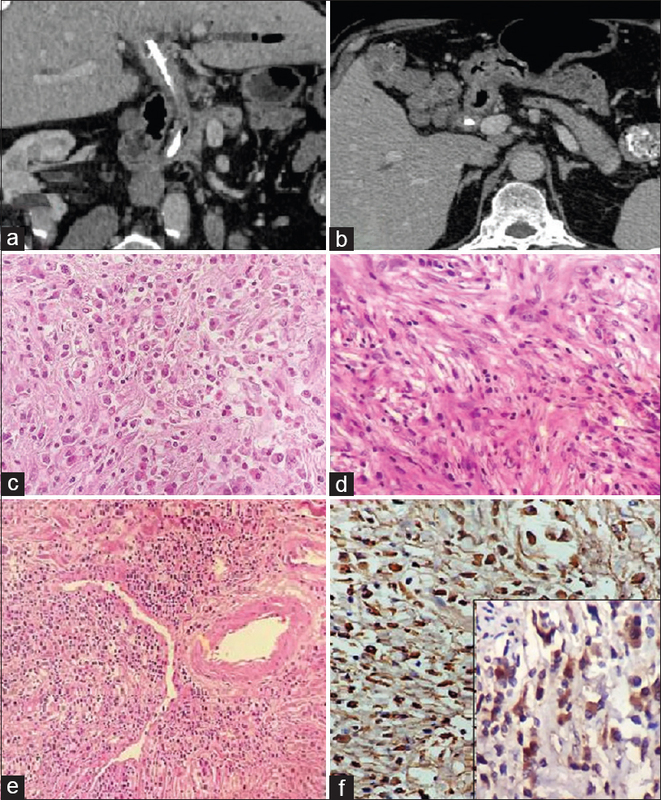 IgG4-related disease: Nomenclature, clinical features, and treatment. Semin Diagn Pathol 2012;29:177-90. Zen Y, Nakanuma Y, Portmann B. Immunoglobulin G4-related sclerosing cholangitis: Pathologic features and histologic mimics. Semin Diagn Pathol 2012;29:205-11. Li J, Zhao C, Shen Y. Autoimmune cholangitis and cholangiocarcinoma. J Gastroenterol Hepatol 2012;27:1783-9. Beuers U, Hubers LM, Doorenspleet M, Maillette de Buy Wenniger L, Klarenbeek PL, Boonstra K, et al. IgG4-associated cholangitis – A mimic of PSC. Dig Dis 2015;33 Suppl 2:176-80. Yata M, Suzuki K, Furuhashi N, Kawakami K, Kawai Y, Naganawa S, et al. Comparison of the multidetector-row computed tomography findings of IgG4-related sclerosing cholangitis and extrahepatic cholangiocarcinoma. Clin Radiol 2016;71:203-10. Montano-Loza AJ, Lalor E, Mason AL. Recognizing immunoglobulin G4 related overlap syndromes in patients with pancreatic and hepatobiliary diseases. Can J Gastroenterol 2008;22:840-6. Al-Dhahab H, McNabb-Baltar J, Al-Busafi S, Barkun AN. Immunoglobulin G4-related pancreatic and biliary diseases. Can J Gastroenterol 2013;27:523-30.